Chelsie: The Jumeirah Carlton Tower is as the name implies part of the luxurious Jumerirah hotel chain. The Jumeirah Carlton Tower is a classy, cosmopolitan five star hotel located in one of London's most exclusive hot spot's- Knightsbridge. 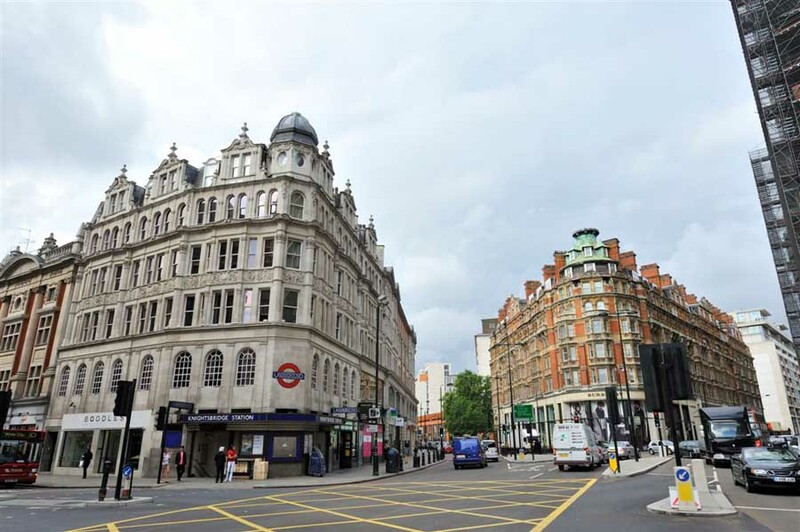 For those of you who are not familiar with London, Knightsbridge is one of London's most exclusive shopping locations. It is in Knightsbridge that two of London's top luxury department stores Harrods and Harvey Nichols can be found, and within easy walking distance the shopping ecstasy continues in Sloane Street. When I arrive in cities I love to explore! One of the many benefits in staying at The Jumeirah Carlton Tower is that some of London's most iconic sights are not far away including Hyde Park, Buckingham Palace and Westminster Abbey. Kate: On arrival we were greeted by a well dressed doorman, who smiled warmly welcoming us into The Jumeriah Carlton Tower. Checking in to the hotel is an experience in itself, and really reinforces the message that you are a valued guest, if not home from home so to speak. Our receptionist Nicole, was delightful. Nicole began our check in by offering us first a warm lemon scented hand towel to freshen up, which we readily accepted before preceding to ask us about our weekend plans with a genuine interest. We were then informed about the additional 'trimmings' that come with such a prestigious hotel including complementary choice of newspaper, wake up calls, dinner plans and links to the airport on our departure. The exceptional service continued, with Nicole taking the time to actually show us to our bedroom alongside pointing out relevant information such as where breakfast would be served. Chelsie and I were incredibly fortunate to be upgraded to one of the Jumeriah Carlton Tower's newly refurbished junior suites. I felt like a little child at Christmas time, I was just so excited and desperate to get my first peak of the suite! Chelsie: The suite is amazing! The room is essentially a small studio; on the left hand side the living room and on the right the bed and bathroom. The living room is spacious and modern equip with a work desk station and furniture. Connected to the living room was our balcony, which allowed natural day light to pour into the room whilst providing us with a view of the lush private gardens of Cadogan place. The luxury continues on the right with the large inviting bed. Crisp clean sheets awaited us, alongside plenty of plump pillows for us to rest our weary heads on at the end of the day. This part of the room is really designed to optimise relaxation with heavy curtains to block out the sunlight and a flat screen TV. I could not wait until bedtime! The bathroom has both a shower and bath for its guests comforts, a built in TV, lighting ranges (ideal for perfecting your make up girls!) and Ren toiletries. The feeling of being valued and home from home is felt everywhere. In the suite there are many examples of this, and it is these examples that I feel make the Jumeriah Carlton Tower stand out. In the living room for example guests are provided with a small collection of books listing both information on the hotel itself and London's history and hotspots. Another example is in by your bed you will find the book and CD 'Deep Sleep 101' which is designed to help you achieve a perfect night sleep. Another touch I really liked, and I have not experienced at other hotels is that when Kate and I returned back to our suite from dinner our bed robes had been laid on the bed. A mat had been laid out by our respected sides with our slippers and a dish of fresh fruit and bottled water was waiting for us. Kate: We woke up feeling refreshed after a great night sleep and headed down to The Rib Room for breakfast. Chelsie and I were shown to our table and informed about our potential breakfast options- a full English breakfast or A la Carte (continental). The breakfast selection is extensive, with a wide range of choice for guests. Items available on the A La Carte menu which we selected consisted of assorted cold meats, smoked fish (salmon, trout, mackerel), delicate pastries, cereal with various toppings including honeycomb and ripe fresh fruit. The food is presented to follow a logical sequence making it easier for you to make sure your favourite items are included! Keeping inline with guest care The Jumeriah Carlton Tower in some cases even recommends food to aid their guests, for example by the fresh blueberries a place card states that they can help to reduce cholesterol. The food was absolutely delicious and really was the cherry on the top for our overnight stay. Chelsie and I would heartily recommend staying at The Jumeriah Carlton Tower for the luxury, ambience, location and unmatchable care that is shown to each and every guest. Jumeirah Carlton Tower Additional Features. The Rib Room: This restaurant has recently undergone an extensive refurbishment by Martin Brudnizki. The Rib Room's menu focuses on the best of traditional British cuisine using fresh, seasonal produce under the guidance of Head Chef Ian Rudge whilst Louise Gordon, head sommelier, oversees the collection of over 450 wines and champagnes. Chinoiserie: This is a beautiful relaxed area for afternoon tea, informal meetings and evening drinks. Chinoiserie has recently teamed up with master patissier and star of Channel 4's Baking Mad series Eric Lanlard to design a delicious afternoon tea menu. This afternoon tea as Chelsie and I can personally testify is unmissable, combining Eric's native French flair with flavours of the Orient and Middle East. Afternoon Tea is served daily from 3pm to 6pm with a live harpist playing thought. GILT Cocktail Lounge: This lounge is incredibly glamours, decorated in shades of cream, gold and black with numerous bespoke touches. The Lounge offers guests a compact list of ten champagnes including Louis Roederer Cristal, alongside a Bellini collection and a cocktail list with monthly specials. Voted Hotel/Day Spa of the Year in 2011 by Pevonia UK and a panel of industry experts, the Peak Health Club and Spa is one of London's very best health and beauty centres. The club is located on the ninth floor of the Jumeirah Carlton Tower, and is available to both members and guests. The club is open 7 days a week, and offers users spectacular views of London alongside having state-of-the-art facilities. The club has a fully equipped gym and aerobics studio, sauna, steam room, an incredible golf simulator, award-winning spa and a 20 metre indoor stainless steel swimming pool. The Club Room is also based at the Peak Health club, and offers guests a relaxing place to meet with friends for an informal lunch or simply to unwind after a work out. The club room serves a selection of healthy meals and snacks alongside fruit cocktails and smoothies which can all be enjoyed whilst guests take in the panoramic views of London. The Peak is open from 6.15 am-10pm Monday to Friday and 7.30am to 9pm Saturday and Sunday. Voted one of the UK's top hotel's for Service in the Conde Nast Gold List 2011 and one of the top UK Business Hotels at the Conde Nast Reader's Travel Awards 2010. The Jumeirah Carton Tower has nine flexible function rooms, with some even overlooking Cadogan Gardens that can hold up to 670 guests. The rooms are perfect for events ranging from boardroom meetings to cocktail parties, or even corporate conferences, presentations or Christmas parties! The management team at Jumeriah Carlton Tower will be on hand to help you plan and supervise your event with expert precision ensuring your event is a success. The Jumeriah Carlton Tower offers a wide selection of elegant rooms to celebrate your big day in unmatchable style. A private entrance to all event rooms will give you and your guests exclusive access to the rooms and out to Cadogan Gardens- a beautiful setting for photographs. The hotels experienced team will guide you through the planning of your day and on the big day itself, going through every detail, ensuring everything from your flowers to the menu to the DJ's are organised to your specifications. Five start service from a five star hotel. Banqueting rooms can be hired on a venue only basis for cultural or religious celebrations. A nominated caterer from our list of preferred caterers can be selected and will be given the full support of banqueting staff.